Is Siemens Positioning Itself As The Electric Aircraft Industry Standard? It’s hard to not bump into a story relating some sort of Siemens-supported electric vehicle (EV) these days. From trains to electric vehicle (EV) motors, the German international giant seems to be everywhere. 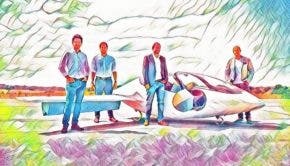 When it comes to electric aircraft, Siemens seems particularly aggressive and ahead of the game, almost to the point of asking the question, is Siemens trying to corner the market and establish itself as the electric flight standard? Electric airplanes are getting quite a bit of attention this year. So far, we’ve covered a few stories highlighting how the industry is moving forward. Siemens has been working the new industry hard. Its electric motors are often associated with maiden electric flights and tests. It also gets out in front on some of those stories, not just subtly participating via hardware inside the electric planes. In its latest public interaction, Siemens showed attendees to Innovation Day in Chicago its e-plane and hybrid electric aircraft progress. Siemens showed a first to a somewhat bewildered US crowd — its Magnus LSA fitted with a 55 kW Siemens electric motor. Siemens plays it cool and reminds journalists that it has no intentions of competing on the OEM front when it can supply those OEMs with its electric motors and expertise. Siemens vice president of electric and hybrid-electric propulsion, Terry Hamlin, said that Siemens wants to be part of the electric mobility (e-mobility) solution and would rather work with than compete with airplane companies, such as Boeing, Airbus, and Rolls-Royce, the last two of which are working on an eFan regional airplane that should see the light of day in roughly a decade. It is obvious to most readers that by now the aviation industry needs a serious shift in the way it uses fuel for its propulsion needs, away from fossil fuels to renewable, clean energy. Much less noise from electric aircraft also mean later flights and landings/takeoffs potentially closer to where we live since e-plane make very little noise gliding to a landing. It’s funny to think our fathers flew across the Atlantic with propeller airplanes that had to stop along the way. The last trip I took to Europe was on a brand new carbon fiber Boeing Airbus 787 that doesn’t pressure the aircraft as much as regular aluminum ones. The progress has been astonishing and the next frontier is that of electric flight. The Siemens electric motor on the Magnus LSA is a perfect way to test 55 kW in the air.